To rapidly assess the current conditions of the structures and identify system vulnerabilities. This inspection typically includes also review of available information for the structures (drawings, past reports, etc). This inspection will provide a detailed mapping of deterioration of the structure. These areas will be reviewed for concrete cracks, rust stains and leaching, scaling concrete components, spalls and reinforcement section loss (where reinforcing is exposed), delaminations, corroded connections, failed repairs, coating, caulk and sealants, and leaking or failed joints. These include both non-destructive (NDT) and exploratory methods, e.g. special investigation tools and strategies are used to evaluate corrosion of reinforcing steel, material properties, location of existing reinforcing, chemical properties of existing concrete elements, etc. Structural evaluation includes the finite element modeling (FEM) of the structural systems subjected to operative loads as wells as transient (earthquake, wind) loads and temperature effects. Linear static, linear dynamic analysis as well as non-linear static and dynamic analysis for each particular structural system can be performed as part of the evaluation. Simplified calculations may be used for simple structures and for verification purposes. Structural evaluation is typically performed following the load requirements and guidelines of the applicable codes. The ACI 313 and the Eurocode are generally used for the evaluation of silos, which is the core of our work in the cement industry. Our staff is familiar with the American Codes as well as the buildings codes in South America, Central America, and other countries such as Japan, China, Philippines, Indonesia, Romania, Poland. We can perform detailed evaluations to analyze all structural seismic or other deficiencies in the assigned facilities. Evaluation includes also foundation analysis. Soil-structure interaction can be performed for structures located in areas with difficult soil conditions. Our deliverable for structural evaluation is a report that includes the structure characteristics, loadings and evaluation criteria, modeling and assumptions, areas with overstresses expressed in terms of demand–to-capacity ratios (DCR’s), and recommendations for strengthening and retrofit. Load rating may be also included for silos depending on the scope of work. A detailed structural assessment is the basis for the retrofit design of the structure. The repair and retrofit design follows the condition assessment and structural evaluation. The retrofit typically includes the phases of schematic design, design development, and final design (construction bid documents). There is a close interaction with the owners in the implementation of the retrofit approach in order to find the best engineering and economical solution and minimize the shut-down time of the particular structure. Our staff has worldwide experience in the strengthening and retrofit of concrete silos (cement, raw meal, clinker, pozzolan) and concrete pre-heater towers. Retrofit techniques for silos includes the use of concrete liners, post-tensioning and fiber wrap materials. 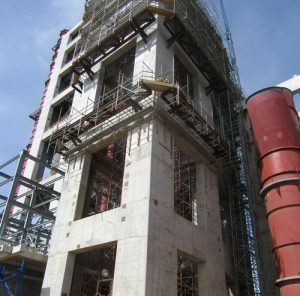 In addition, in other types of structures techniques such as the use of high-strength elements, increase of cross sections, addition of new structural elements, combination of above and improving connections details are also available. 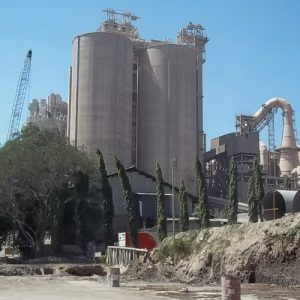 Our staff expertise includes the design of new storage facilities for cement Plants. In the new design the work is usually broken into conceptual design, design development, and construction document phases. The work is coordinated with the GA’s, mechanical engineers and the owners. We provide construction support on our projects. This support generally consists of: on-site construction structural observation visits, shop drawing or material submittal reviews, field RFI submittals, and preparation of final as-built drawings based on contractor records or mark-ups. Site visits are especially important to verify that the construction follows the intents of the retrofit for existing structures or the new design. Our staff expertise includes providing peer-review of structural design for new and retrofit structures. The objective of the peer-review is to confirm to the client that the analysis and detailed engineering of the structural system has been performed in accordance with the design criteria, applicable codes, and good engineering practices. Typically, our peer review starts with the review of the design criteria of the project. The peer-review could also include the review of soil investigation reports. 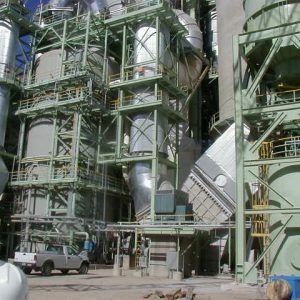 Our staff has the expertise to prepare design criteria documents that will be the basis for new designs and/or retrofit designs of plant buildings, equipment evaluation and repair, and for the structural design of new cement plants. Following design development of a suitable structural system, our team can complete the necessary design calculations and prepare construction bid documents. Our staff has experience in the earthquake risk evaluation of all facilities in cement plants. This evaluation includes structural systems and equipment in order to identify vulnerable structural components that may compromise the operability of the Plant after an earthquake. Mitigation approaches are presented as part of these evaluations. 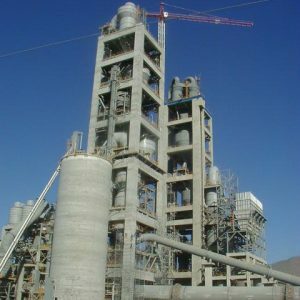 Our staff has also experience in providing post-earthquake evaluations of the installations of cement plants worldwide.